I was watching a video that Slammers posted of their new borderstaffy, Hazard, yesterday morning, and loved one of their practice drills. I asked Craig Knowles if I could post it here (thanks, Craig!) because I had just written about practicing in another blog post, and thought this would be a cool drill to share with others. Go to about 2:10 into the video to see the recall drill shown below. I've done lots of recalls with puppies, but never with a dog racing in the other lane like that. Duh. Why didn't I think of that? 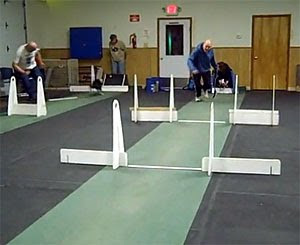 Watch how good their timing is, too -- Craig runs when the other dog is hitting the box. The puppy is really focused, not even paying attention to the other lane. Working a puppy this young next to another dog probably goes a long way towards preventing chasing issues in the future. That is great. We do this at our practices the rare time there are young pups. The pups are never out there by themselves. There is always a dog doing something. This weekend the plan is to do head to head recalls with a green dog and experienced call (gating between). I love doing things like this with my puppies. 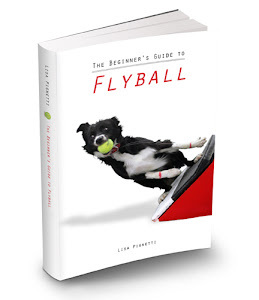 I have them on tugs by 3 weeks and fetching balls and trading for tugs by 6 weeks so I had to get creative in flyball drills. It took a lot of convincing for me to be allowed to work my puppies while other dogs were working/racing (the old "puppies need to be worked alone so they focus" mentality) but the results have paid of handsomely. Last week during recalls a dog crossed over and ran at my 13 week old puppy, she just sized him up, leapt over him, and continued on to her tug! Since I started working them with other things going on I have never had an issue with a dog that wouldn't focus or worried about what was going on in the other lane, it has been really nice. By the time our puppies joints are ready to do jumps/box work all it takes is teaching a good turn and they are off to the races. I highly recommend these methods to anyone training puppies, working through the initial distractions pays off in the end.